Unless you are preparing a manuscript all alone with absolutely no other person involved in any way, you are likely faced with the challenges involved in deciding who actually qualifies as an author, and once that decision is made, deciding whose name should be first, second, third and beyond. The first and vitally important guideline for this process is this: early discussion and open negotiation among all parties involved. This discussion can be initiated by any individual involved in a project – and hopefully that person is already familiar with the resources presented here as guidelines for the discussion. This is no simple challenge. In fact, matters of authorship are the most common cases presented for discussion by COPE (Committee on Publication Ethics). Their excellent discussion paper on Authorship should be at the top of your reading, and re-reading list every time you embark on a new project! When you initiate an early discussion with your collaborators who might also become authors, if you start with a review of the widely accepted guidelines for authorship described here, you by-pass, or at least lessen the temptation to get involved in arguments and disagreements based purely on personal preferences and motivations. During the submission process for ANS, all authors must confirm that they meet these four criteria, and soon, you will also be required to include a statement for each author that describes the specific contributions that they have made to the work (criteria #1). 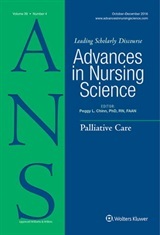 The fact remains that there are typically people who have made a contribution of some type to the conception or design of the work, but have not participated in all of criteria 2, 3 or 4; thus they do not qualify as an author, but they should be acknowledged as non-author contributors in the “acknowledgements” that are published with the article. The matter of the order in which authors’ names appear is even more difficult to determine. The earlier you can settle this matter, the better for all concerned. Further, whatever the decision, you will have a much more comfortable working relationship throughout the entire process if everyone involved is fully “on board” with the order in which authors’ names appear. You can base this decision on the relative contributions of each person, or, if all contributions are roughly equal, you can use an alphabetical or reverse-alphabetical order. There is a specific situation that many ANS authors face – that of the role of the dissertation or thesis committee members who have worked with a student who ultimately is expected to produce publishable manuscripts based on the scholarly project required for the degree. The ANS editorial and publishing team concur with the recommendations that have emerged from ICMJE and COPE – faculty advisors do not qualify for authorship based on their advisory role alone. Even though it is typically the case that faculty advisors make significant contributions to the development of the dissertation project, and in turn the content that emerges in a publishable article, faculty advisors rarely meet all of the criteria 2, 3 and 4 above. Therefore they should be acknowledged for their contribution as an advisor to the project required for the degree, but not as authors. Of course, in the event that faculty advisors do actively participate and meet all four criteria, they should be authors. However, in my opinion, the student (or former student), as the sole author of the dissertation or thesis, would typically be named as the first author based on their relative investment in the project. I welcome your comments and responses related to this important issue! Leave your ideas below – I will respond!